him for years, mainly because his practice is very patient-oriented. however, the clinic has failed to keep track of ROI in the past. advertise himself and his clinic in the referral community. The clinic lacks its use of social media. be an increase in the number of women requiring treatment. Provide patient with the best quality of care in both vein and laser treatment. Become #1 choice among referral sources and in the community for laser and vein treatment. referral sources for laser and vein treatment. decision and to better assess the clinic profitability. convenient. It also easy to get your message to many different people and patients. It can also be a good way to communicate with patients. growth is actually taking place and how they can continue making growth. day and health coverages are decreasing. The clinic should work on making care affordable while giving quality care. graduate and 82.6% Philadelphia are high school graduate or higher. 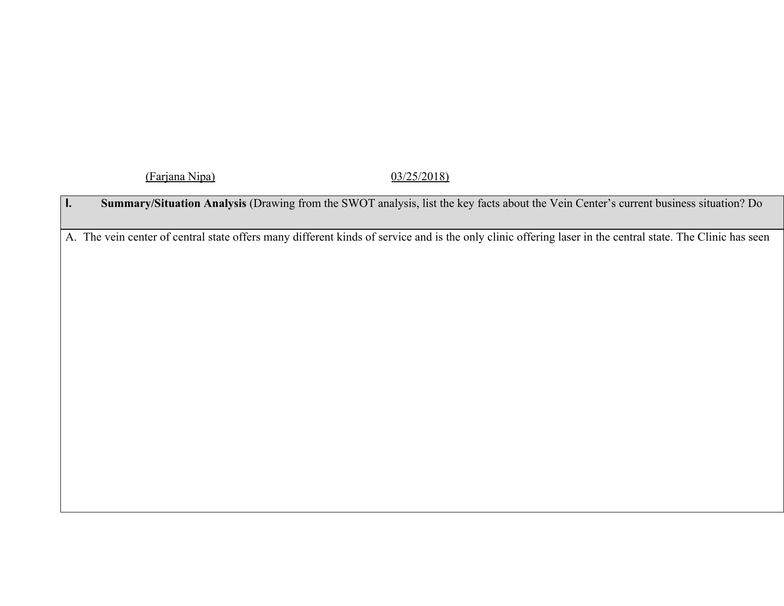 Do not copy the swot analysis into this section: the vein center of central state offers many different kinds of service and is the only clinic offering laser in the central state. The clinic has seen continual growth and success. Also as the baby boomers population grows, there will be an increase in the number of women requiring treatment. 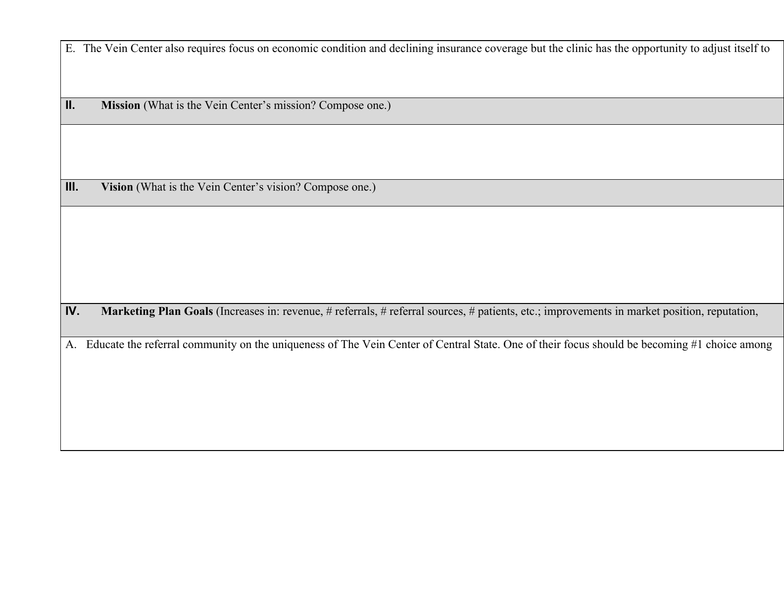 Page 1: the vein center also requires focus on economic condition and declining insurance coverage but the clinic has the opportunity to adjust itself to the changing market condition. Provide patient with the best quality of care in both vein and laser treatment. Vision (what is the vein center"s vision? compose one. ) Become #1 choice among referral sources and in the community for laser and vein treatment. 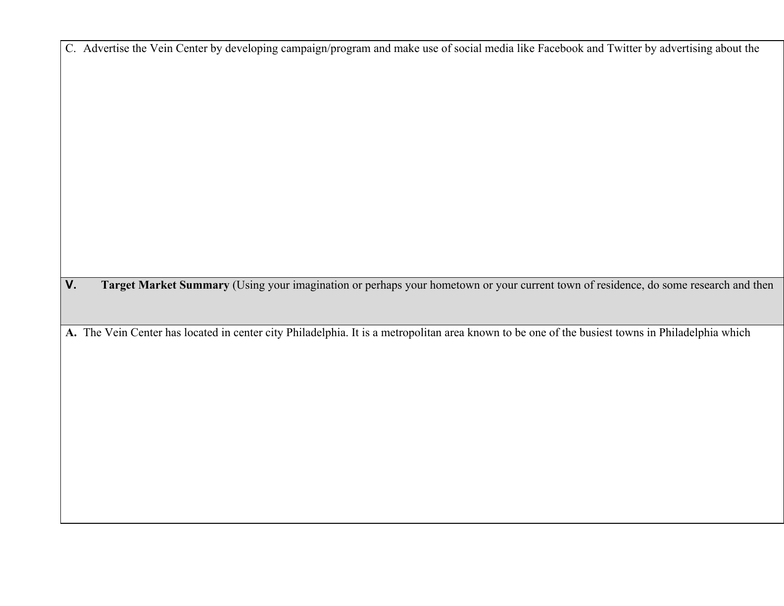 Marketing plan goals (increases in: revenue, # referrals, # referral sources, # patients, etc. ; improvements in market position, reputation, visibility, etc.